Published on February 9, 2017 in Lake Winnipesaukee Hotel. Closed Tags: grand opening, renovations. 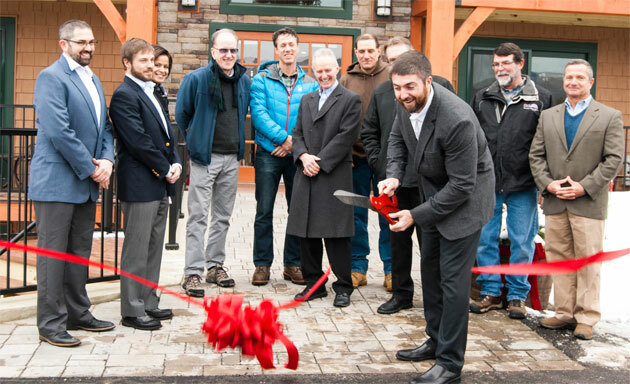 On Friday, January 20th, the Center Harbor Inn held a ribbon cutting ceremony to mark the grand opening of the new facility after nearly a year of aggressive renovations. Originally a series of vacation cottages dating back to the 1920’s, the main lodge building on the property was erected in 1968. The Inn offered comfortable hotel rooms with private decks on a sandy Lake Winnipesaukee beachfront just walking distance from the shops and restaurants in Center Harbor. Over the years, however, the facility experienced a prolonged period of deferred maintenance and was no longer positioned to do justice to its unique and valued location. Following a lengthy negotiation process, the hotel group that operates Steele Hill Resorts was able to purchase the inn this past March. With the support of town officials and local businesses, a major renovation project kicked off to completely revitalize the hotel. Conneston Construction spearheaded the contracting services using architectural plans from Stewart Associates Architects and interior design input from Frances G Hodges Interiors. The renovation involved stripping the building down to the studs and completely rethinking the structure. Key changes included the addition of Douglass Fir clad beam work to frame out the new decking system, new accent gables to break up the roofline and two large decorative cupolas along the center of the main lodge. The interior work echoed the appearance of the exterior with an emphasis on both modern and rustic features. Inside the main lodge, bathrooms were completely gutted and fully tiled. The addition of modern glass panel dividers, new plumbing fixtures and custom hickory vanities finished off these spaces. All new carpeting, custom furniture and beautiful floor to ceiling, hickory headboards with floating shelves dressed out the upscale, lakeside accommodations. The addition of amenities included complete refurbishment of the nearly 200 feet of sandy beachfront and the construction of a beautiful, 4-season outside hot tub facility overlooking the lake surrounded by heated pavers offering direct access to the building. Interior improvements also included the addition of an all new fitness center with an adjacent sauna facility. With the completion of this extensive renovation, the hotel will now offer an upscale, lakeside hospitality experience allowing guests to enjoy wading into the relaxing waters of Lake Winnipesaukee from the sandy beachfront or walking into town to experience all that Center Harbor has to offer.